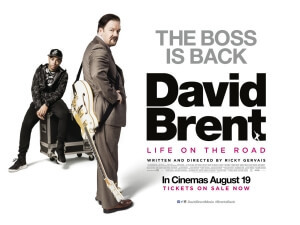 Filling what has now become the annual “Try To Replicate The Success Of The Inbetweeners Movie” slot of the summer, is a feature film starring everyone’s favourite boss from hell, David Brent. Much like in the fictional universe he lives in, Ricky Gervais’ breakout character hasn’t been up to much since The Office ended in 2003. He’s been in a few Comic Relief sketches, a few YouTube videos on Gervais’ channel, and has even had a couple of brief cameos in the American version of the sitcom, but mostly he’s been at the back of Gervais’ head whilst he’s been busy offending half of Hollywood during his Golden Globe hosting stints. Once again, however, David Brent is back in the spotlight, and he couldn’t be happier – while everyone else is struggling what way to best cope with him, and we don’t just mean the other characters. Your enjoyment of David Brent: Life on the Road, wherein Gervais as Brent heads off on a small tour with his band Foregone Conclusion (because of course that’s what David Brent’s band is called) and aspiring rapper Dom Johnson (Doc Brown), will depend on whether or not you can tolerate the character for more than a half-hour sitcom episode. Like with last year’s Minions, you’ll be in heaven if you can, and in hell if you can’t. We can say that we sympathise with both sides; on the one hand, he can be extremely irritating to be around, as is how the character was always written to be, but on the other he is such a pathetic specimen of a human male that you can’t help but feel just a little bit sorry for him, especially when he’s actively trying to pursue something he never should. Brent in this movie is now a sales rep for a cleaning company, a far cry from his previous general manager role at paper company Wernham Hogg, and it seems that the only thing keeping him afloat other than his desires to make it big as a musician, is his unbelievably awkward sense of humour, something that ironically always prevents him from achieving anything in life. None of his other band mates can tolerate him, hardly anyone at the company has any real respect for him, and even in his private life he’s a lonely and desperate man clinging onto the increasingly unlikely possibility that there’s someone out there who genuinely likes him. When you really think about it, that’s a seriously worrying existence, and we even get to see Brent having a session with a therapist after we learn that he has indeed been battling depression. Knowing that you live in a world where nobody outside of your own ego can stand you would drive anyone to the edge of insanity, and in this case he shows it by embarking on a small tour that doesn’t even go outside the Slough and Reading border, and digging into his pension funds to pay for hotels, playing space, and a giant tour bus he’s not even invited onto. You might occasionally laugh at how awkward some of his interactions and attempts at humour are, but mostly there will be a dark and even disturbing feeling that you’re watching someone’s mental breakdown as he goes from gig to gig looking more and more like a prat. If you do find Brent and Gervais’ dry sense of humour to be one of the greatest things to happen in the history of British comedy, chances are you’ll come out feeling somewhat satisfied, even though it probably isn’t Brent’s finest hour overall. It can definitely raise a few laughs here and there, mainly from his sheer awkwardness and failure to succeed, but you’ll surprisingly feel far more uncomfortable watching this person undertake such a desperate exercise in egotism with the vain hopes of getting people to actually like him. That’s a task made far more difficult since he’s a character who you either can’t stand or can’t get enough of, something that even his band mates make obvious more than once (in one attempt to connect with them, Brent is goaded into buying everyone’s drinks, and they rarely even acknowledge him in return). Some fans may probably even notice a few of the jokes to be near word-for-word recitals of previous ones from The Office, like a mini-tirade on making fun of disabled people that also appears in one of the earlier episodes of the first series. All in all, much like Brent himself, his film is wildly all over the place, and your enjoyment will entirely depend on your tolerance for awkward and cringing humour. David Brent: Life on the Road gets a few good laughs just based on the main character’s sheer awkwardness, but overall you may end up feeling uncomfortable by its depressing and unnerving undertones.